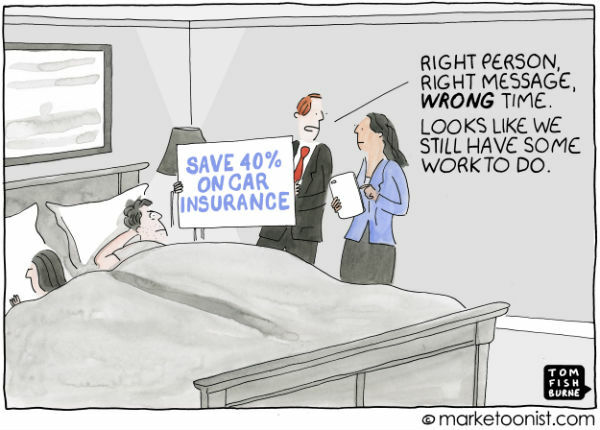 I love how Tom Fishburne aka marketoonist always does a great job of showcasing marketing truths. While the focus for marketers to deliver the right message to the right audience at the right time is nothing new, it’s also safe to say that we have a lot of work to do. For example, I was recently in the position of having to look for a new external battery charger. I seem to burn through these things like candy. A search on Google gave me relevant ads right on top. 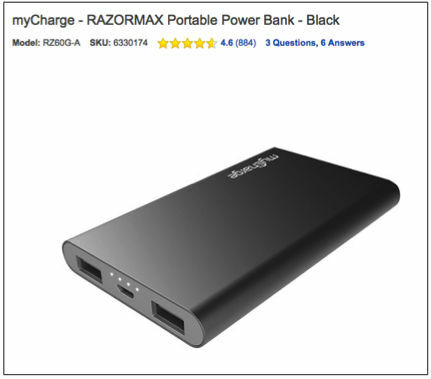 I clicked on a Best Buy ad and checked out the RAZORMAX Portable Power Bank. It looked interesting enough and while I noticed reviews from the Best Buy site, I’m the kind of person that likes validation from 3rd party review sites. So I went back to search and looked for reviews. 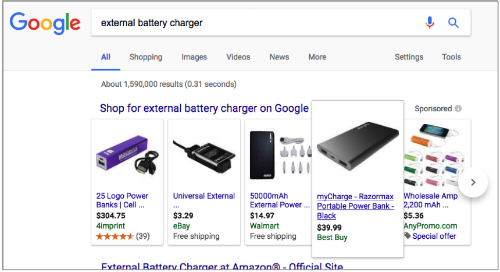 I arrived on Tom’s Guide and what ad from Best Buy dominated the page reviewing the best portable chargers? An ad for Sony 4K TVs. This seemed like a lost opportunity for Best Buy. I was hunting for something specific and leaving data trails, but the brand I was considering most wasn’t connecting those dots. This is a scenario that extends across channels of course. As I am prone to do with tech purchases, I went to Facebook to ask my network essentially the same question I searched for on Google. I received a cornucopia of suggestions from my network of tech savvy connections. But what ads did I see? 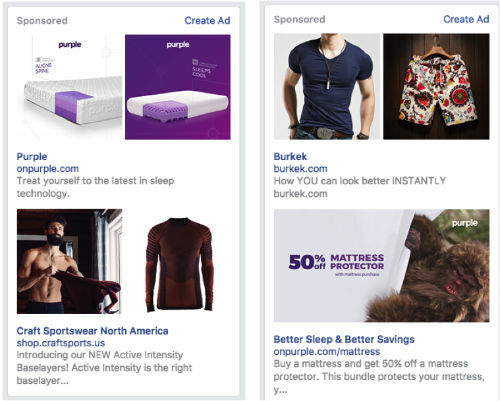 Purple mattresses and clothing ads featuring photos of guys that don’t really represent me or what I’m looking for. Of course if they were more like me, that would be scary. But I think you get the point. 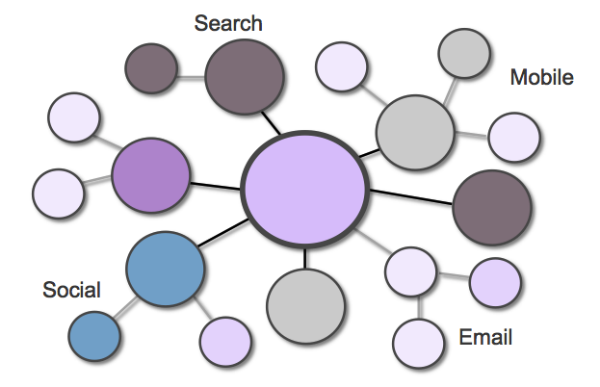 I was creating data crumbs of intent across channels and the dots were not being connected by the right brands when it came to my customer experience. While brands are collecting more data than ever before, and have become more sophisticated at implementing effective campaigns on specific channels, there are disconnects in terms of meeting increasing expectations of consumers. Buyers don’t care how hard it is. They care about finding the best information that is relevant, meaningful and specific to them. Right time, right place and message. The customer journey has evolved from what we’ve traditionally explained as a linear path (was it ever linear?) 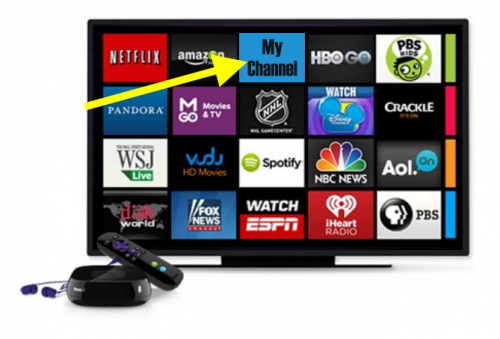 to something far more sophisticated across devices and channels. Customer expectations have evolved and are focused more on experiences as a differentiator. 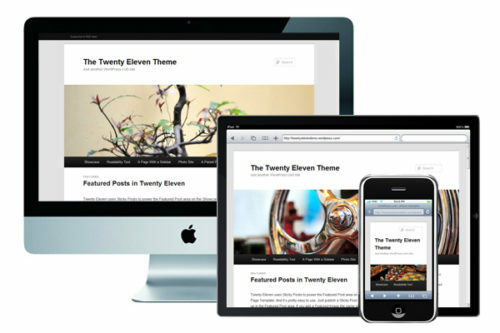 At the same time, the sheer volume of content being produced creates information overload. Of course there’s no “one size fits all” customer journey, but the importance of mapping and matching content and media types to stages of the journey are more important than ever. The question is, how are brands understanding the context of these journeys to create relevant experiences? Internet access is ubiquitous with over 50 billion connected devices expected by 2020. I’m sure some of the people reading this post are using multiple devices right now–a laptop, and phone for example. How are brands meeting the expectations of customers who have always on, everywhere access to information? Competing with marketers’ good intentions for relevant and meaningful experiences across channels is the fact that on average, consumers in the US are consuming media for 12 hours and 7 minutes per day (eMarketer). That’s a paradox of choice at scale. At the same time, 70% of marketers are not using the insights they’re pulling from data because it’s too complex or difficult (Ensighten). A lot of that difficulty comes from data fragmentation across tools, tactics and organizational silos. Today’s marketing mix includes more tactics than ever to meet consumers’ insatiable demands for information. Back in 2001 when Susan Misukanis started a Public Relations firm, PR and light content was it. Then we brought in SEO. And blogging. Online Advertising was added. Then Social Media, Content Marketing, Influencer Marketing and so on. The proliferation of marketing technology tools isn’t helping either. 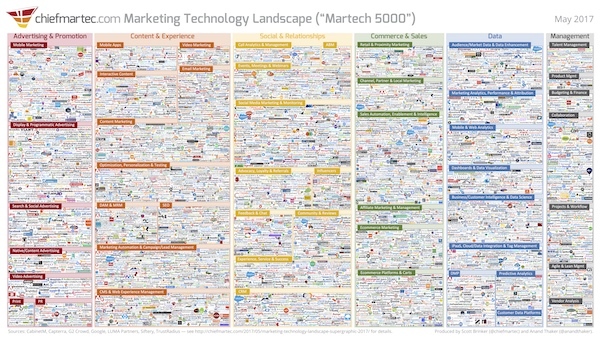 Infographics like the one above from Scott Brinker with over 5,000 martech tools and platforms can put marketers into shock– or “martech shock” as I like to call it. As for data, there are often silos between departments where each is creating unique data or even the same data in different contexts. Suffice it to say, data fragmentation is a problem. So what is a solution? One of the universal truths that we’ve operated under at TopRank Marketing is about the power of information specific to customers’ that are actively searching for solutions. To be the best answer is a strategic approach to marketing that naturally empathizes with the customer journey to deliver the most relevant experiences at all the touchpoints that matter most for customers. Combined with cognitive solutions, a best answer strategy for marketing is something that can actually scale. A great start is a data-informed approach to content marketing that uses context and insights to create conversations with customers that are relevant, personalized and meaningful across channels. You simply cannot create a best answer approach to marketing without customer insight. It’s important to ask key questions that empathize with the customer journey. Especially, “What experiences do your customers need on which channels in order to buy?” This is an essential question because when customers are seeking solutions, one of the most important jobs we have as marketers is to ensure that brand content is the best answer where ever customers are looking. Understanding context and preferences for the customer information journey as it relates to how buyers discover solutions content is the key. Those insights about preferences for content types, topics and devices, and the triggers that motivate action, all combine to inform an effective best answer strategy. With those insights about content discovery, consumption preferences and triggers for action, marketers can use connected data to architect best answer content programs that are accountable to attracting the right customers, engaging them with meaningful experiences and inspiring them to take action and convert. Making sense of a best answer approach to marketing at scale means reflecting on the possible: What if you could make your marketing easier and more meaningful at the same time? It’s been reported that customers can hit 17 touch points before they buy. Imagine if every single one those interactions delivered on your brand promise with meaningful personalization? How to be the best answer for customers with as many of those touchpoints as possible is one of the most important challenges for marketers as we move into 2018. Ultimately, the information is there. The data is there. Customers are telling you what they want. The question is, how to connect those dots of data to understand and optimize customer experiences? Certainly, AI is part of a new era of marketing to answer that question. If you want to learn more about how AI, machine learning and cognitive solutions can help connect the dots of data for better customer experiences, keep reading. 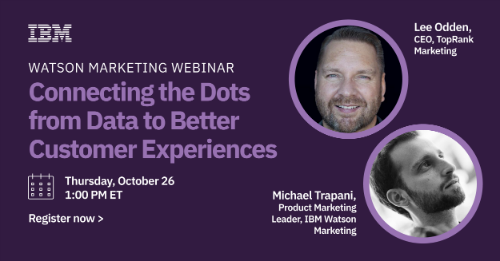 I recorded a webinar with Michael Trapani, Product Marketing Leader at Watson Marketing on this topic where he dives a bit deeper into how marketers can connect their ecosystems with AI solutions. You can view that webinar here. The post Connecting the Dots from Data to Better Customer Experience appeared first on Online Marketing Blog – TopRank®.